Nice and thin-just like I like them. 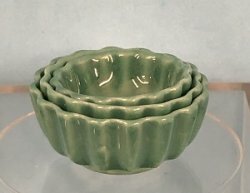 These mixing bowls are glazed a beautiful blue/green color and would work nicely in a retro kitchen or modern day! The largest bowl is less than 1" across the top and 3/8" high.